The Mauritshuis’s legendary collection contains more than eight hundreed paintings, the majority of which were created during the seventeenth century in northern and southern Netherlands. The core comes from the collection of Stadholder Prince William V of Orange-Nassau, who assembled an outstanding group of pictures, in addition to inheriting a trove of masterpieces from his predecessors. Coincidentally, I just finished a painting for a Prince who is giving it as a surprise to his wife, whose family is closely related to the Orange-Nassau line. 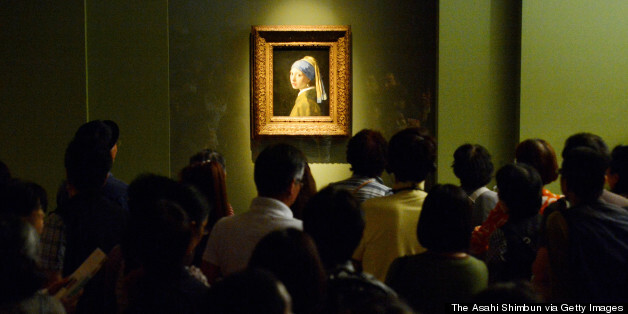 Vermeer’s painting Girl with a Pearl Earring has an entire room to itself. The painting is cordoned off, reminiscent of the Mona Lisa at The Louvre. The woman next to me had binoculars — next time I am bringing binoculars so I can better see the painting. Although I had to wait in line in San Francisco, I missed not being able to go up and examine the painting, look at the brushstrokes to try and figure out what he was thinking as he painted the painting. I often will look at a painting, and then paint it in my mind. The Frick has three paintings by Vermeer from the museum’s permanent collection, which are seen after exiting the exhibit. One of my favorite paintings in the exhibit is Carel Fabritius’ Goldfinch. Fabritius studied with Rembrandt between 1641 and 1643. Unfortunately, he died in 1654, following a gunpowder explosion that leveled a considerable part of Delft (and probably destroyed much of Fabritius’s oeuvre). 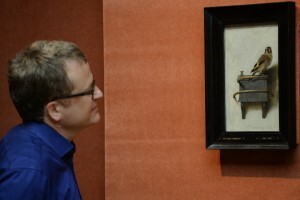 Apparently, this painting hung beneath Vermeer’s Girl with a Pearl Earring in the museum. I cannot look at a Rembrandt without thinking of Julius Held, with whom I took a Rembrandt seminar at the Clark Art Institute Graduate Program in Art History. He was an old world scholar who demanded excellence from his students and in a very small class (six) it afforded an in-depth look into Rembrandt, with perhaps the greatest living Rembrandt scholar (and I might add no place to hide if you weren’t prepared for the seminar or your turn at a presentation). My focus was on Rembrandt’s landscape etchings, which probably served as an influence in my own period of line drawings. There was a wait to get into the museum (if it’s cold, dress warmly) — and don’t forget to bring your binoculars.